Had this for a good while, just hanging around in full view. Only noticed the other day that something was different. Side and centre neck position markers? Looks like those dot markers are 'after market'. I would have expected them to match the side markers otherwise. Meadows wrote: Side and centre neck position markers? The dot markers are 7 mm, quite large, seem to have been installed prior to the fingerboard being machined as they follow the radius perfectly with no witness marks of an aftermarket installation. Who knows what they got up to at the factory?? Could have been a customer request, perhaps? Looks a little ..... busy, doesn't it! 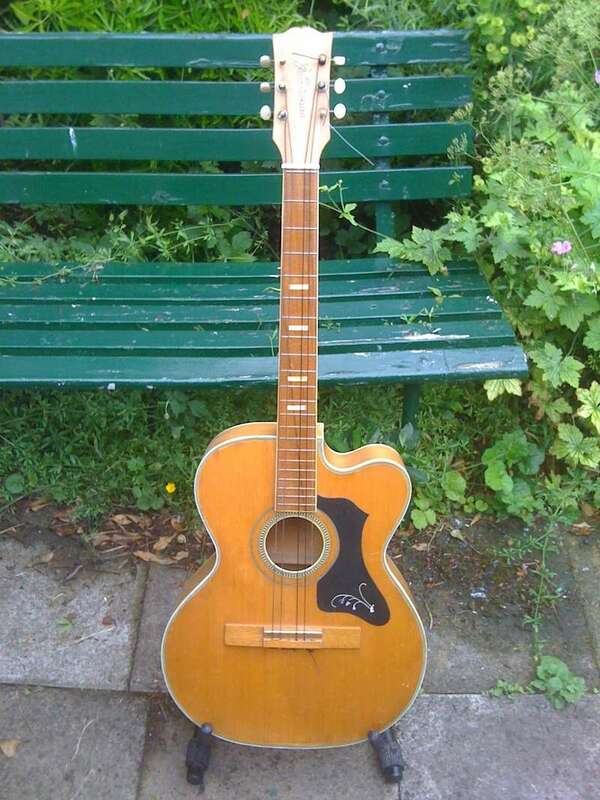 It came on an Alder wood body, possibly using up what parts were available? 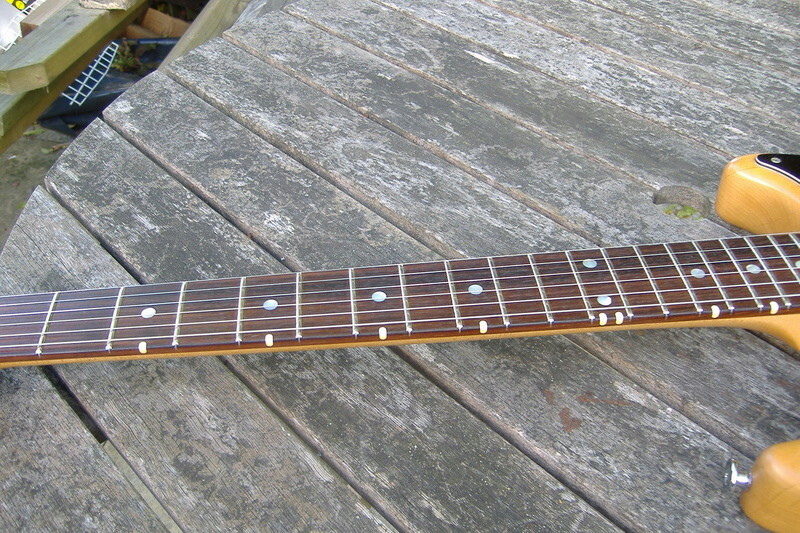 Talking of not the norm, see anything different with the neck on this old Futurama CW? Strange, and not at all attractive. Doesn't make a lot of sense to me to wrap around like that since the reason for them in the first place is to read the marker from the edge! If it was a custom job, maybe the buyer was vision impaired or summit? p.s. Please don't tell me they also glow in the dark! Strange eh, well that's 2 necks the same. Snap! Can't see your other pics Si. Here's a 'normal' neck which looks a lot less busy. Thanks Damian, will try again. Meadows wrote: Thanks Damian, will try again. Had a few mods on that one Simon. Sound good? they usually do.. Yes, but not by me, I bought it already Frankensteined. At the top end, Sperzel locking tuners. On the plate, only the middle pup is original (shame), the bridge is a Duncan and the neck unknown but super rich, all balance really well output wise and offer a good pallet. The jack plate had been moved, the volume pot taps the bridge and there is a five way toggle. 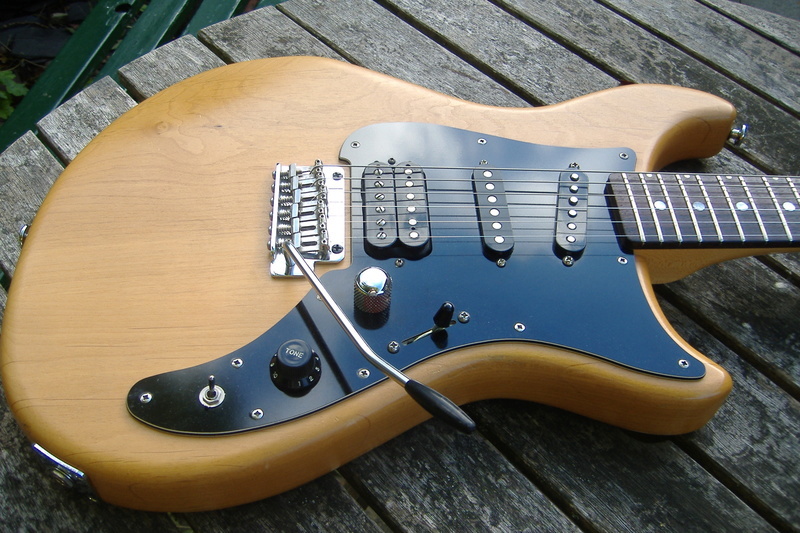 The switch in the old jack position engages the humbucker in any position. The standard of work is very good (luthier), and overall, a great gigging machine that is lighter than my Prestige Corsairs. Sound a like a good combination of pups. Was up in Rushden/Stoke Bruerne last week but that was a spare of the moment thing. Will give you a shout if passing up your way Simon. Westbone wrote: Sound a like a good combination of pups.